Monterosso al Mare is the most western of the 5 towns and the closest to being a classic beach town of the Italian Riviera. Vernazza, and Corniglia are just a few kilometers down the coastline. The latter is different from the others because it is situated on a plateau, over 300 feet above sea level, while the others lie next to the Sea. And Manarola and Riomaggiore lie on the eastern end. All of the villages are linked by charming cobblestone pathways that make home to local musicians. One can have a quiet seaside stroll while listening to melodic accordion music. But be prepared to take in a few sets of stairways, as each village is scattered with scenic steps that reach high into the mountains. It seems that every street, alleyway, passageway is a long stairway to somewhere. Who knows how many outside stairways exist in these 5 villages!! The main street is doted with tiny restaurants (capacity of 20-25), a few souvenir shops, and several grocery stores. We are talking tiny stores with fresh fruits and vegetables out front, and a bakery and meat counter inside. You won’t find much in the way of packaged food here. Fly to Pisa, Italy and take the train to Cinque Terre about 1-½ hours or fly to Genova and take the train. You can drive there but once you arrive your car will be useless. More: don’t bother with a car and don’t show up in high season without a room reservation. Rooms (mostly small apartments) range from 80-$125.00 per night. The agriculture is what this place is truly about. 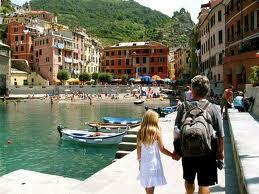 Cinque Terre is 5 towns but there are smaller rural communities tied to each one that get few, if any, tourists. These people, like their forefathers, still work the terraced farms on the hillside. Some of the farmland has been abandoned and is scrub, but most has been passed on generation-to-generation leaving some plots that are only 4 meters by 20 meters. They farm mostly wine grapes and olives for olive oil. Old stonewalls, built hundreds of years ago with no cement just piled rocks have created this mosaic of farm terraces. In old days these terraces were very difficult to access to plant, fertilize and harvest. Now they have a monorail with a small-motorized cart that can take whatever they need up and down the mountain. We are headed there next weekend…curious to find out if most things have re-opened since last year’s mudslides? any suggestions for which trails are best with kids?